Almost as in cue, following its earlier leaks, Samsung’s Galaxy S6 flagship just got posted online and then taken down within an hour for pre-order. Courtesy of Dutch carrier Tele2, we can now have an idea of what Samsung’s upcoming flagship will do to your pockets and when the device can be expected to become available for the general public after its launch. 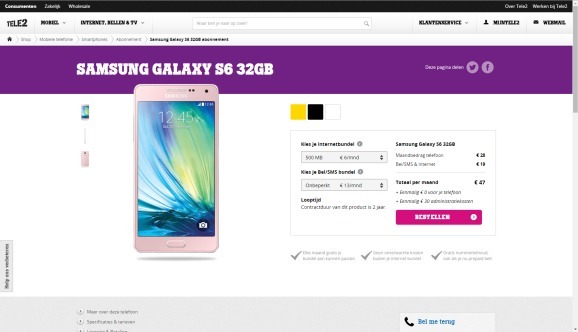 Dutch carrier Tele2 seems to be a little too eager to gain some market with the launch of Samsung’s ultra-anticipated flagship this year. The carrier just posted the device online for pre-order, only to take down within an hour of the initial posting. Taking down the listing would be the smart choice, despite the fact that we get denied of an early listing of the device to ogle at. Tele2’s listing was full of inaccuracies and inconsistencies, some of which you’ll be able to spot in the screenshot above. Not many details were posted by the carrier, except for the processor on the device, which had been listed with four sets of 1.3 GHz Cortex A53 and four sets of 1.9 GHz of Cortex A57 cores in what seems to be the Exynos 7420. Too bad the listing was incomplete. We’ll keep you updated in case anything new pops up. Stay tuned.